Commonly known as kaccha kela, raw bananas/ plantains belong to the banana family but tend to be firmer and cannot be eaten raw. 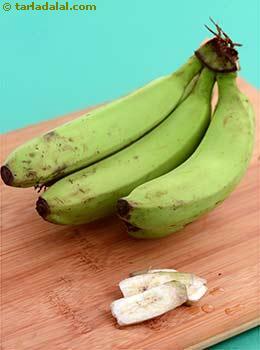 They require cooking and are used when green or under ripe. They are a staple food in tropical regions of the world and are used in varied ways like steamed, fried etc. Commonly referred to as "potatoes of the Caribbean" since they resemble in flavor. The glycemic index of raw banana is estimated to be around 40 which falls under low GI category. The glycemic load of approx. ¾th cup of chopped raw banana is 5.6. Although raw banana belongs to the banana family, it has totally different health benefits. Is raw banana safe for diabetics? The glycemic load of ¾th cup of chopped raw banana is 5.6 which makes raw banana an ideal vegetable in the diabetic menu plan. Although it contains 14 grams of carbohydrates in ¾th cup, it is of complex types. Raw banana contains immense amount of resistant starch which cannot be broken down by the digestive enzymes and moreover acts like a fiber than a starch. Thus helps in controlling the blood sugar levels. It also helps in reducing the risk of cardiovascular disease by lowering the blood cholesterol levels. Like ripe banana, raw banana is also high in potassium content which aids in blood pressure regulation. Is raw banana suitable for weight loss? ¾th cup of chopped raw banana provides around 64 calories. However it has a good amount of fiber which helps in slow digestion, make you feel full for a longer period of time and thus aids in weight management. Replace your starchy vegetable like potato by green bananas which will somehow give you similar taste and also help in controlling your appetite due to the presence of fiber and resistant starch. Resistant will remain undigested in the gut and acts like a fiber.